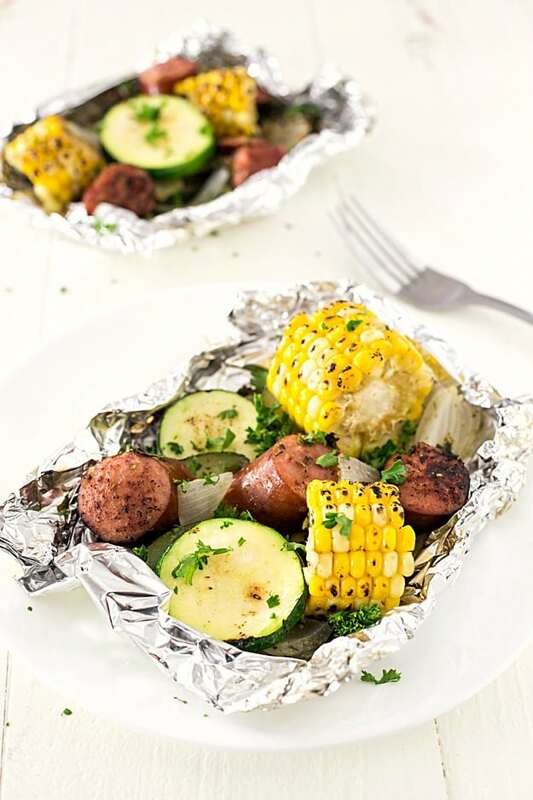 Kielbasa Sausage & Grilled Vegetables in Foil – These foil packets are so quick to assemble! Perfect for camping or a quick dinner. Packed with sausage, zucchini, and corn with the most amazing seasoning! A family favorite any night of the week. What’s not to love about easy meals in foil? We are always about easy dinners around here. Easy and quick meals do not have to bland, they can also pack a lot of flavors. And I am going to tell you, this kielbasa sausage and grilled vegetables in foil are fantastic and packed with a lot of flavors. Hint there is a reason why I used kielbasa sausage opposed to another sausage. Even though it’s the middle of August summer is not oven just yet! It’s my favorite season followed by spring, and I am not letting it go this quick. What I love most about foil packet meals is that you can make cook them on the grill in the warmer month, or even bake them in the oven. The taste does change a little bit from grilling to baking because of the smoke in the grill. 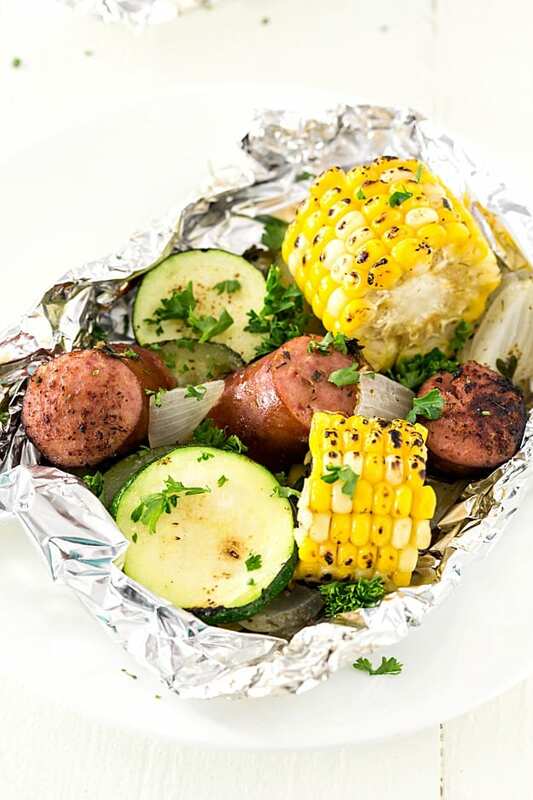 You can also get a little crazy and grill these foil packets in the cooler months. We have done it so many times and once there was even snow on the ground. Well worth it! If you love foil packets, you should try my campfire potatoes! They are a little spicy but so tender and delicious! The reasoning behind using kielbasa sausage opposed to another type of sausage is the flavor. Kielbasa sausage is already cooked uses different spices than Italian sausage. It adds the perfect flavor to the corn and zucchini coins. But feel free to use any sausage you enjoy, just remember the cooking times may vary some. If you have never made foil packet dinners before, you are going to love how easy they are! Clean up is a breeze, and they don’t create many dishes. Less time cleaning up and more time eating are always a favorite. 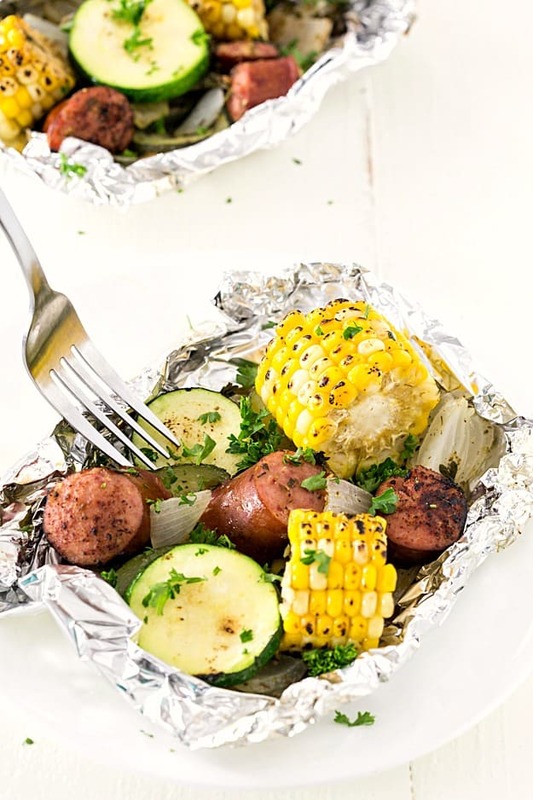 Kielbasa Sausage & Grilled Vegetables in Foil - These foil packets are so quick to assemble! Perfect for camping or a quick dinner. Packed with sausage, zucchini, and corn with the most amazing seasoning! A family favorite any night of the week. Place the kielbasa, corn, zucchini, onion into a medium bowl. Whisk together the paprika, oregano, parsley, garlic, and oil together in a small bowl and pour over top the kielbasa and vegetables. Season with salt and pepper and mix until the spices, kielbasa, and vegetables and toss until combined. Place two sheets of heavy-duty aluminum foil on top of each other on a baking sheet. Add a generous amount of mixture in the center and foil the first piece up the first piece of foil and then the next piece to form a secure encasing. Repeat until the mixture has been used. Grill covered for 15-20 minutes until vegetables are tender. Carefully remove from the grill allowing the foil packets cool for a few minutes and serve.